Internet gambling has expanded for no other reason than it serves the consumer. A business is successful when its product meets the needs of it's customers and online gaming does. Why? Convenience is one reason. You live hours away from a casino. Your work schedule and personal demands does not permit the time. Online is there at your absolute leisure. And you can make playing decisions without the pressure you have in a casino. This helps the basic strategy learning curve. Great games. The blackjack games have all the good rules. Double-zero roulette has a house edge of 5.2%. Single-zero 2.7%. Online you can find single-zero roulette with the surrender rule. That is where a player loses only half their bet in certain situations when the zero appears. A low 1.35%. Craps offers high free odds on the pass line bringing the edge down to 0.25% or less. Careful there because of the high variance. Sports betting is very competitive. Lines are good and instead of normal 10% vig you can find 5% in some situations. Unheard of in casinos. Bonuses and comps. They can be very generous at times. It is very important to capitalize on these as it can really cut into the house edge. Tournaments and novelty games. They can be great fun. Tournaments are interesting because there you are not competing against the house but against other players. If you enter a tournament that has some poor players you may have the edge. If you choose to gamble online the first and most important step is picking the right casino. Believe me it is a jungle out there. You must be careful. Before I go any further I should state that 888Casino and any others you see on this site meet all the criterion I am about to list. 1) Integerty is number one. The games must be honest and you must be paid your winnings. 2) The software platform is outstanding. Speed, graphics and the feel of a real casino are superb. It has lots of interesting games and good progressive jackpots. 3) Toll free support by telephone. If you have a problem you want to talk to a real person. You want your online casino to be large enough to offer this service. 4) Bonuses must be generous and frequent. Land based casinos give you food and drink. The online casino equivalent is the cash bonus. 5) Play for free option. This lets you practice. More about this later. It is not all a one way street. You have some responsiblities also. Gamble with unneeded money, not in excess and you should be willing to keep records of all transactions. Bonus offer rules should be kept so you make sure you meet the wagering requirements. The print screen option is perfect for this. Practice is the key to success in all fields. Several students that I have trained to become professional players all used this practice method. It simulates game-like conditions. Click on the above banner on this site. 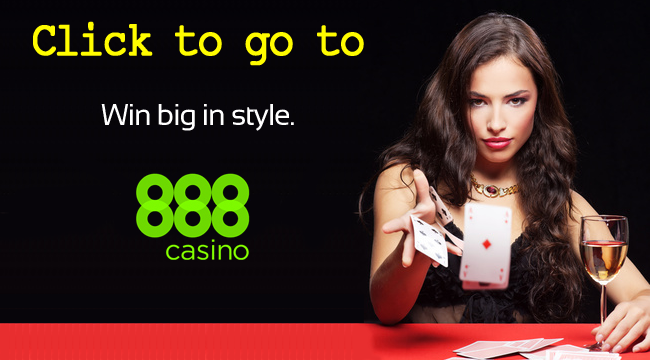 It will take you to 888Casino. Click free download. A page of standard regulations will appear. Read and click agree. Choose a currency. You will receive a user name and password. Save them. This all shoud take a minute or two. Now click on play for free. That's it. You can practice all you want at no cost. Go at the speed you are comfortable with. Leave and return whenever you desire. Test yourself. 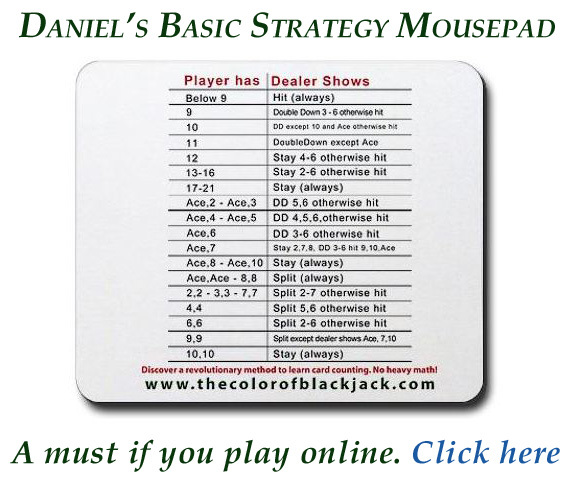 Play 20 hands without looking at the chart. Click on history and the hands you just played will appear in a neat column. Go down the column while checking it against the chart. Not only are you learning but is great fun at no cost.